If you’ve been online in America over the past few months, you’ve probably heard of the Trivia Crack app. With estimates ranging into the tens of millions of players, a lot of people enjoy testing their knowledge of facts in six different categories of questions. If you’ve played Trivia Crack, you know that you get information about your own scoring – the percentage of questions that you answer correctly. But there’s no easy way to compare that against the rest of the world. This being America and all, we like to keep score and see how we stack up against others. So what’s a person to do? Well, we at Corona Insights have taken care of that for you. We’re in the business of providing bright thinking and brilliant guidance, so it should come as no surprise that we have a strong interest in facts. We’ve been doing a lot of (ahem) “field research” in the game, and we now present to you a nine-part series on Trivia Crack scoring. Welcome to Part 1, and we’ll post additional analyses every few days or so. First, we should note that the analysis process itself is interesting, because there are some complexities to gathering and analyzing the data that might not be obvious. We’ll address that in the third blog of this series. But for now, we know you’re probably here to read about scores, so let’s dive right in. In our first blog, we’ll talk about the category of Science. We gathered and analyzed the scores of over 400 Trivia Crack players by participating in both one and one and group challenges against random opponents. Here’s the distribution of scores that we developed. So half of all Trivia Crack players have a score of 72 or higher in Science, and only 10 percent score more than 80. If you want to be in the top one percent, you’re going to need an 85. As we’ll see later, you can break into the top 1, 5, or 10 percent in Science with lower scores than in most other categories. 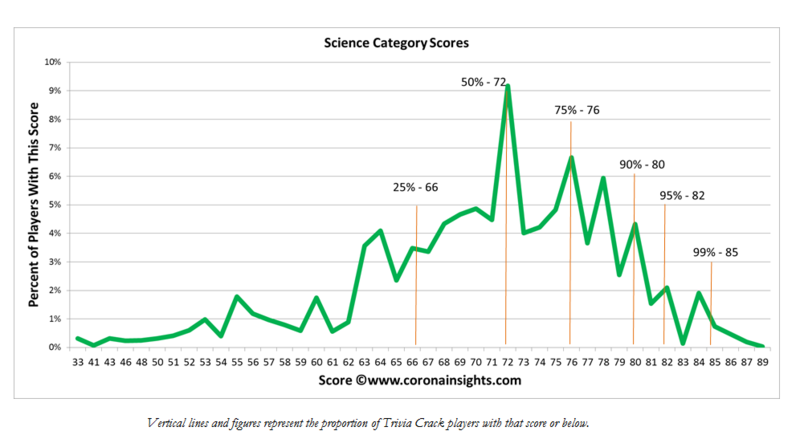 This means that Science players tend to have a tighter range of points than most other categories. Now, how good are people at Science compared to other categories? 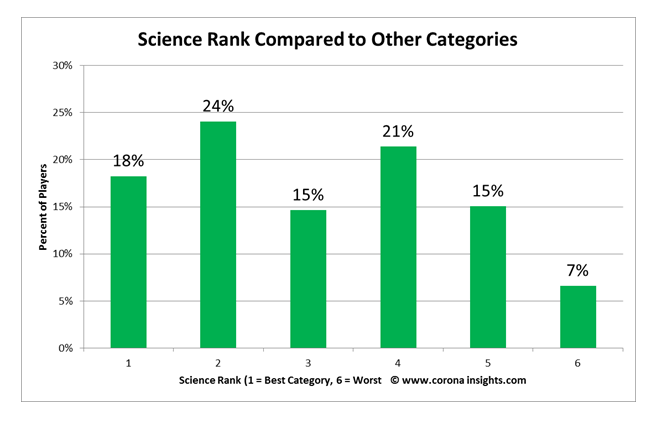 It may surprise you, but Science is the third-highest category on average. A lot of people are pretty good at it – it’s the best category for 18 percent of players and second-best for another 24. But just as important, very few people are really bad at Science compared to their other categories. It’s the worst category for only 7 percent of people. We all have a little bit of Isaac Newton in us, I guess. If you’re good at Science, does that predict that you’re a good overall player? And if you’re weak at Science, are there other categories where you’re strong or weak? We did a correlation to test that analysis. We won’t reveal our analysis of total scores until later – you know, to build up suspense – but we can look at correlations. First off, we should note that there’s a strong correlation between every category and total score. We would expect that, because your total score is just the sum of all of your individual category scores. However, there’s a stronger correlation in some categories than others, and Science is less strong than most as a predictor. It’s still strong, with a Correlation factor of 0.876, where 0 means no relationship at all and 1 means that it’s a perfect predictor. However, it’s only the fourth-highest among the six categories. Our theory is that Science tends to drag down some of the higher-scoring players. And what category most closely aligns with Science? 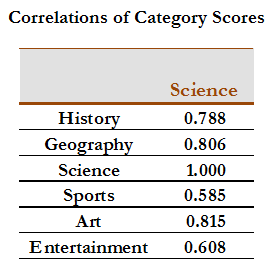 Another simple correlation analysis shows that the scores that run most closely in parallel to Science scoring are Arts scoring. If you’re good at Science, you’re pretty likely to be good at Arts. But there’s a much lesser relationship with Sports. If you’d like to know exactly where you stand on Science, here’s a chart that estimates the proportion of players who score at or above a particular score, based on our modeling. Check out the next post examining the exciting world of sports trivia. I have a score of 91% in Science after answering 1566 questions in that category. According to your chart that would make me the highest ranked in science in the world. Granted, I’ve never seen anyone else’s profile with a score of 90% or above, but still, that can’t be right, am I misunderstanding the chart? Or is it just a rounding issue? Just curious since I was trying to find my actual ranking. James Taylor: if you really have a science score of 91%, you would know that your relative ranking is just a statistical probability.. Yes, my scores only included English-language players, because I developed the database by playing a whole bunch of games and recording the scores of my opponents. I would not compete well in a Turkish-language version of the game.